Sterol regulatory element-binding protein 2 (SREBP-2) also known as sterol regulatory element binding transcription factor 2 (SREBF2) is a protein that in humans is encoded by the SREBF2 gene. SREBF2 has been shown to interact with INSIG1 and CREB-binding protein. ↑ Hua X, Yokoyama C, Wu J, Briggs MR, Brown MS, Goldstein JL, Wang X (Dec 1993). "SREBP-2, a second basic-helix-loop-helix-leucine zipper protein that stimulates transcription by binding to a sterol regulatory element". Proceedings of the National Academy of Sciences of the United States of America. 90 (24): 11603–7. doi:10.1073/pnas.90.24.11603. PMC 48032 . PMID 7903453. ↑ "Entrez Gene: SREBF2 sterol regulatory element binding transcription factor 2". ↑ Qiu XM, Jin CT, Wang W (Apr 2014). "Association between single nucleotide polymorphisms of sterol regulatory element binding protein-2 gene and risk of knee osteoarthritis in a Chinese Han population". The Journal of International Medical Research. 42 (2): 320–8. doi:10.1177/0300060513507392. PMID 24496149. ↑ Dobrosotskaya IY, Goldstein JL, Brown MS, Rawson RB (Sep 2003). "Reconstitution of sterol-regulated endoplasmic reticulum-to-Golgi transport of SREBP-2 in insect cells by co-expression of mammalian SCAP and Insigs". The Journal of Biological Chemistry. 278 (37): 35837–43. doi:10.1074/jbc.M306476200. PMID 12842885. ↑ Yang T, Espenshade PJ, Wright ME, Yabe D, Gong Y, Aebersold R, Goldstein JL, Brown MS (Aug 2002). "Crucial step in cholesterol homeostasis: sterols promote binding of SCAP to INSIG-1, a membrane protein that facilitates retention of SREBPs in ER". Cell. 110 (4): 489–500. doi:10.1016/S0092-8674(02)00872-3. PMID 12202038. Hua X, Wu J, Goldstein JL, Brown MS, Hobbs HH (Feb 1995). "Structure of the human gene encoding sterol regulatory element binding protein-1 (SREBF1) and localization of SREBF1 and SREBF2 to chromosomes 17p11.2 and 22q13". Genomics. 25 (3): 667–73. doi:10.1016/0888-7543(95)80009-B. PMID 7759101. Yokoyama C, Wang X, Briggs MR, Admon A, Wu J, Hua X, Goldstein JL, Brown MS (Oct 1993). 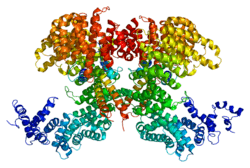 "SREBP-1, a basic-helix-loop-helix-leucine zipper protein that controls transcription of the low density lipoprotein receptor gene". Cell. 75 (1): 187–97. doi:10.1016/S0092-8674(05)80095-9. PMID 8402897. Wang X, Zelenski NG, Yang J, Sakai J, Brown MS, Goldstein JL (Mar 1996). "Cleavage of sterol regulatory element binding proteins (SREBPs) by CPP32 during apoptosis". The EMBO Journal. 15 (5): 1012–20. PMC 449996 . PMID 8605870. Pai JT, Brown MS, Goldstein JL (May 1996). "Purification and cDNA cloning of a second apoptosis-related cysteine protease that cleaves and activates sterol regulatory element binding proteins". Proceedings of the National Academy of Sciences of the United States of America. 93 (11): 5437–42. doi:10.1073/pnas.93.11.5437. PMC 39264 . PMID 8643593. Sato R, Inoue J, Kawabe Y, Kodama T, Takano T, Maeda M (Oct 1996). "Sterol-dependent transcriptional regulation of sterol regulatory element-binding protein-2". The Journal of Biological Chemistry. 271 (43): 26461–4. doi:10.1074/jbc.271.43.26461. PMID 8900111. Oliner JD, Andresen JM, Hansen SK, Zhou S, Tjian R (Nov 1996). "SREBP transcriptional activity is mediated through an interaction with the CREB-binding protein". Genes & Development. 10 (22): 2903–11. doi:10.1101/gad.10.22.2903. PMID 8918891. Duncan EA, Brown MS, Goldstein JL, Sakai J (May 1997). "Cleavage site for sterol-regulated protease localized to a leu-Ser bond in the lumenal loop of sterol regulatory element-binding protein-2". The Journal of Biological Chemistry. 272 (19): 12778–85. doi:10.1074/jbc.272.19.12778. PMID 9139737. Harris IR, Farrell AM, Holleran WM, Jackson S, Grunfeld C, Elias PM, Feingold KR (Feb 1998). "Parallel regulation of sterol regulatory element binding protein-2 and the enzymes of cholesterol and fatty acid synthesis but not ceramide synthesis in cultured human keratinocytes and murine epidermis". Journal of Lipid Research. 39 (2): 412–22. PMID 9508001. Kan HY, Pissios P, Chambaz J, Zannis VI (Feb 1999). "DNA binding specificity and transactivation properties of SREBP-2 bound to multiple sites on the human apoA-II promoter". Nucleic Acids Research. 27 (4): 1104–17. doi:10.1093/nar/27.4.1104. PMC 148292 . PMID 9927745. Seidah NG, Mowla SJ, Hamelin J, Mamarbachi AM, Benjannet S, Touré BB, Basak A, Munzer JS, Marcinkiewicz J, Zhong M, Barale JC, Lazure C, Murphy RA, Chrétien M, Marcinkiewicz M (Feb 1999). "Mammalian subtilisin/kexin isozyme SKI-1: A widely expressed proprotein convertase with a unique cleavage specificity and cellular localization". Proceedings of the National Academy of Sciences of the United States of America. 96 (4): 1321–6. doi:10.1073/pnas.96.4.1321. PMC 15461 . PMID 9990022. Nagoshi E, Imamoto N, Sato R, Yoneda Y (Jul 1999). "Nuclear import of sterol regulatory element-binding protein-2, a basic helix-loop-helix-leucine zipper (bHLH-Zip)-containing transcription factor, occurs through the direct interaction of importin beta with HLH-Zip". Molecular Biology of the Cell. 10 (7): 2221–33. doi:10.1091/mbc.10.7.2221. PMC 25438 . PMID 10397761. Kotzka J, Müller-Wieland D, Roth G, Kremer L, Munck M, Schürmann S, Knebel B, Krone W (Jan 2000). "Sterol regulatory element binding proteins (SREBP)-1a and SREBP-2 are linked to the MAP-kinase cascade". Journal of Lipid Research. 41 (1): 99–108. PMID 10627507. Yang T, Goldstein JL, Brown MS (Sep 2000). "Overexpression of membrane domain of SCAP prevents sterols from inhibiting SCAP.SREBP exit from endoplasmic reticulum". The Journal of Biological Chemistry. 275 (38): 29881–6. doi:10.1074/jbc.M005439200. PMID 10896675.